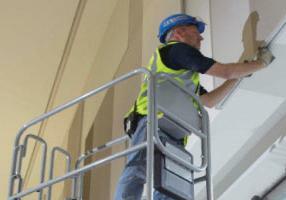 A brief guide to 'The Work At Height Regulations 2005' can be found on the HSE WEBSITE. These regulations were developed due to the large number of accidents and injuries occurring whilst people were working at height, often using inappropriate equipment for the job and not using appropriate safety equipment. "A place is 'at height' if a person could be injured by falling from it." Falls from height are the greatest cause of workplace fatal injuries. So the working at height regulations, aimed at reducing the number of accidents resulting from working at height in the workplace, established that a place is 'at height' if a person could be injured by falling from it. Falling from even very low heights can cause very serious injury to the person involved. The effects of these injuries can reduce a persons quality of life for years after the accident, with ongoing pains and recurring injuries. Low level access platforms have been developed to reduce the risks involved in working from height and they have become one of the safest ways in which to work at height. The rules established by HSE apply to all work that needs to be carried out at height where there is a risk of a fall liable to cause personal injury. Everything from construction work, overhead cable installation and clearing gutters, to changing a light bulb, is covered by the regulations. The regulations place duties on employers, the self-employed, and any person who controls the work of others. Those involved in work at height are trained and competent. The place where work at height is done is safe. Equipment for work at height is appropriately inspected. Where they cannot avoid working at height and where they cannot eliminate the risk of a fall, use work equipment or other measures to minimise the distance and consequence of a fall should one occur. Ensure that no work is done at height if it is safe and reasonably practicable to do other than at height. Ensure that the work is properly planned, appropriately supervised, and carried out in as safe a way as is reasonably practicable. Plan for emergencies and rescue. Take account of the risk assessment carried out under Regulation 3 of the Management of Health & Safety at Work Regulations.